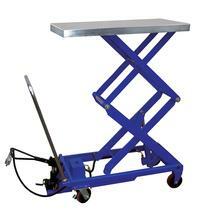 Features two speed foot pump and hand held reciprocating air/oil power to raise the platform. 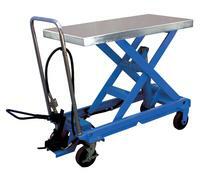 Utilize the two speed foot pump for minor height adjustments and the factory air/oil power for effortless lifting up to 2,000 uniform pounds. Partially stainless steel carts (Pic. 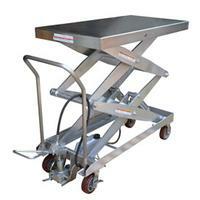 3) - The platform, frame, handle, caster rigs, and hardware are all stainless steel. Pump assembly, hydraulic cylinder, and scissor legs are zinc plated. Wheels are poly-on-poly.